This year marked the 47th annual NeoCon, America’s largest commercial interiors show, at Chicago’s Merchandise Mart. NeoCon differs from many traditional tradeshows in that exhibitors occupy enclosed showrooms as opposed to typical tradeshow booths. Attendees have 12 floors and over 700 exhibitors to browse through thousands of new products that cover a spectrum of vertical markets including workplace, healthcare, hospitality, retail, education, public spaces, and government. Commercial interiors products range from floorcoverings and wallcoverings to furniture, seating and technology. Many designs, particularly for floorcoverings, were derived from nature and art. Bringing natural elements to enhance indoor spaces is a growing trend, from faux hardwood finishes to naturally occurring patterns and colors in carpeting. The majority of floorcovering producers interspersed luxury vinyl tile (LVT) with carpet, particularly in transitional spaces such as between a hallway and a kitchen. The displays were attractive and fresh, and the different flooring types complemented each other quite well. To continue a growing trend, most producers displayed eco-friendly products and services. Sustainability was the name of the game. Another trend was specific to producers of commercial carpet tiles. Many manufacturers have introduced tile systems that are meant to be shown together in a continuum, particularly in groups of three. For example, there were several examples where tiles went from one light colored pattern to a second transitional tile to a third darker tile. When seen together in a space large enough to give the effect room to breathe, the patterns were more characteristic of broadloom than they were of carpet tiles. The general mood at the show was upbeat, and several companies reported that Monday had been one of the busiest days for this show in recent memory. You can see show highlights on the NeoCon website and from various social media sources. 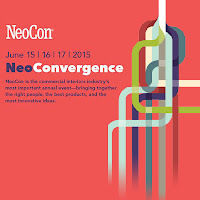 Did you attend NeoCon this year? If so, what were your favorite trends?